What Kind of HoloLens Apps Can We Expect? Microsoft’s augmented reality development, the HoloLens, is an absolute must-see for 2016. This interactive headset projects holograms over the physical world, allowing for the user to experience and interact with virtual objects without accidentally running into walls. The developer’s kit became available for shipment in January, and we can’t wait to see what kind of HoloLens apps are going to be developed. The HoloLens is a small holographic computer in a completely self-sufficient headset; no PC connection is required to use it. The device can display holographic scenes and objects that the user can interact with using their hands. You can resize, rotate, and create 3D objects with just the flcik of your fingers. Microsoft’s announcement video reveals usability that makes this technology appropriate for everyone. You can stream video, use your favorite apps in your living room and work on design projects all from the comfort of home. We wouldn’t be surprised if a developer connected HoloLens to a smart house app, furthering the total immersive experience. 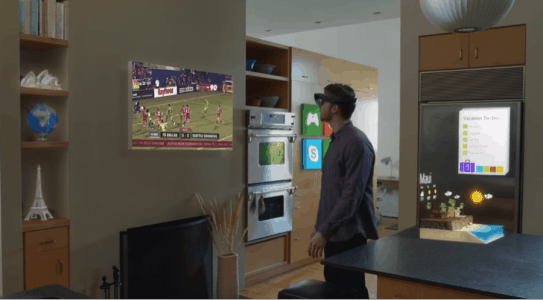 HoloLens would make video streaming apps viewable at any time, in any space. No longer would the constraints of a phone or tablet screen, or the immobility of a television or computer limit your viewing capabilities. 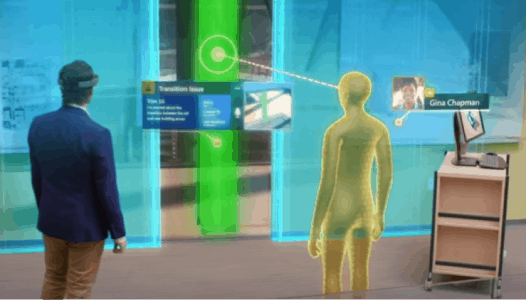 HoloLens apps can be configured to move with the user, allowing for a screen that could follow you around. With the recent shift to delayed and on-demand viewing, HoloLens is the optimal platform for true watching what you want, when you want. Completely OneDrive-capable, HoloLens can help industries like engineering, design, manufacturing, and even space exploration. Users can discuss concepts in real time, on a platform that allows for mutual viewing of both the project and the other person. Not only is HoloLens more efficient than traditional videoconferencing, it is also a more effective method of communicating because of the 3D plane. Schematics can be rendered to any scale and altered in real space, making complex mapping of 3D objects in 2D nets a thing of the past. 3D tutorials, art that doesn’t need cleanup, and interactive communication with the Mars Curiosity Rover are all part of the augmented reality that is expected to be released during the Windows 10 timeline. HoloLens apps are the future of communications, lifestyle, and business sectors, and they are surprisingly easy to develop. Holograms are a solution to the needs of the here and now generation. Mobile apps are interactive and immediate, but HoloLens’ ability to present content with unlimited display space and three dimensions gives designers the ability to create freely. Luckily, making HoloLens apps isn’t all that different from making mobile apps. HoloLens runs Windows 10, meaning any Universal Windows Platform (UWP) app will work with minimal adjustment. For example, Xbox games can be streamed to HoloLens the same way they are streamed to Windows 10 computers. The biggest difference is that HoloLens has a third dimension to work with. To make it even easier to design apps for HoloLens, Microsoft has collaborated with Unity in creating shared installations and new scripting templates that integrate the Unity toolchain and pipeline with Visual Studio. Both Unity Pro and Unity Personal Edition will include the Unity for HoloLens software package, making HoloLens apps simple to create. We have already seen the rise of wearable technology and how sensory data and smartphone apps can create a digitally integrated living experience. The HoloLens will bridge the gap between the digital and physical worlds in a way that will make apps even more interactive within everyday life. Want to get started building an app for HoloLens? We can help you through the process. See how —call us at (210)-590-2734 to get started.